Marae means 'unique' or 'rare' and lzakaya is a Japanese gastro-pub. 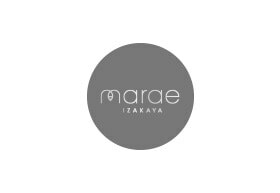 Together, Marae lzakaya is a fine dining restaurant with a unique menu full of beautiful and mouth-watering surprises. From the signature dish- a selection of nine flavours presented in a hand-crafted timber tray- to a grilled salmon smoked in natural wood paper, to hojicha gelato served in a timber sake cup and homemade soy sauce presented in individual syringes, each dish ignites the senses. The interior design by Melbourne-based Kestie Lane Studio recalls home, with zones for casual seating, a sushi train, more formal dining and a bar with a sake master, as well as larger tables for special occasions. A unique experience, Marae lzakaya is a place to connect with food, fun and friends.